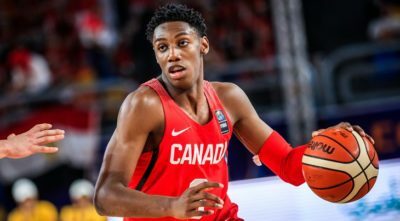 Son of former pro player Rowan Barrett and godson of NBA legend Steve Nash. Combination of size, strength and skills which make him very hard to stop. Too strong for outside players and has the requisite handles to go by inside players. Has the ability to knock open jumpers.Array of moves and floaters around the basket. Clutch player, has always dominated in youth competition. notably putting 38pts against the USA in the 2017 FIBA U19 World Cup. Plays like a vet, draws a lot of fouls. Very good athlete but not elite. Outside shot needs to be refined, is able to hit set shot but must work on hitting Js after cuts or curls like a guard. Handles also needs improvement to avoid troubles against good defensive swingmen in the NBA.